Nunavut’s economy is set for impressive growth over the next few years, thanks to a new wave of mines coming on stream, says the territorial government’s lead economist. Overall investment in mineral exploration and mine development is expected to reach nearly $1.4 billion in 2019. That’s down from 2018, which saw total spending exceed $1.6 billion, but much higher than any previous year in Nunavut’s history. And that spending is expected to continue to grow by half a billion dollars, on average, for each of the following few years, as production at Nunavut’s newest mines ramp up. 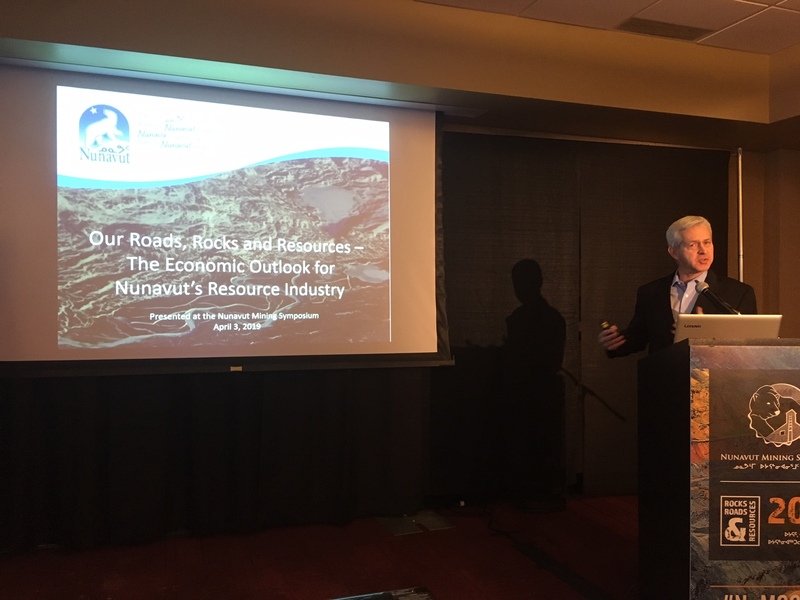 “The next three years are going to be quite remarkable,” said François Picotte, the Government of Nunavut’s senior economist, during a presentation he delivered to the Nunavut Mining Symposium on Wednesday, April 3. This growth is expected to be largely driven by Agnico Eagle Mines’s new Meliadine gold mine, as well as its satellite Amaruq deposit. Other potential projects, such as Sabina Gold and Silver Corp.’s Back River gold project, and Baffinland Iron Mine’s proposed phase-two expansion of its Mary River mine, aren’t included in these projections. So if these plans come to fruition, mining investments could be even larger, said Picotte. 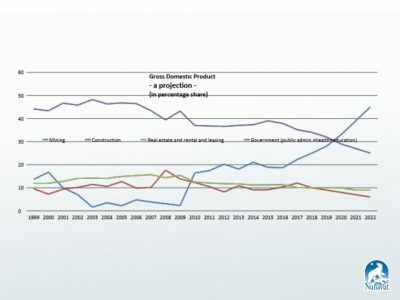 Picotte’s presentation also offered a raft of information about positive social and economic changes that have occurred since the creation of Nunavut in 1999. This year, mining’s share of Nunavut’s economy is expected to surpass government spending for the first time in the territory’s history. In 2019, mining’s share of Nunavut’s economy is expected to surpass government spending for the first time in the territory’s history. While government spending once made up close to half of Nunavut’s economic activity, it’s been steadily trending downward, and is now around 35 per cent. 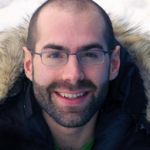 Since Nunavut’s inception in 1999, the territory’s economy has grown by nearly 120 per cent. That’s much higher growth than in every other province or territory. 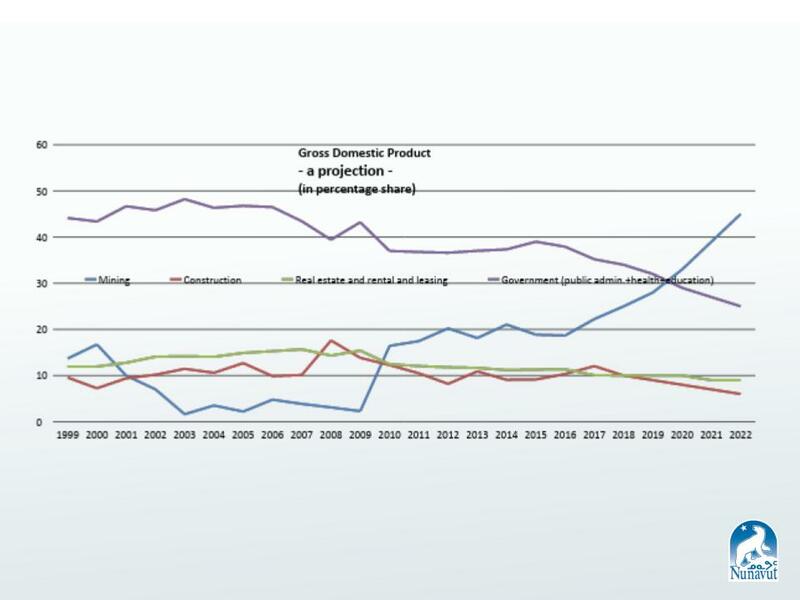 Nunavut’s balance between imports and exports is also much less skewed than it used to be. At its peak in 2008, during the construction of Agnico Eagle’s Meadowbank mine, the territory’s import/export ratio was 10.6—meaning that for every dollar made on exports, more than $10 was spent on imports. Growth in mineral exports have since brought this ratio down. In 2017, it stood at 1.9. “That ratio will continue to come down as we continue to produce more minerals,” said Picotte. While unemployment remains widespread across Nunavut, the territory has never seen so many of its residents with jobs as now. 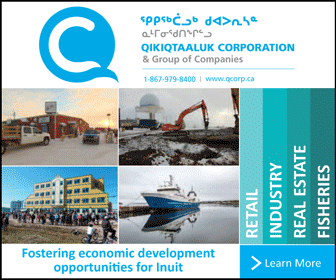 “We have the highest level of employment in the history of Nunavut these days,” said Picotte. In 2017, the Conference Board of Canada estimated that about 1,600 workers from southern Canada came to Nunavut to work in Nunavut. Picotte says that figure is probably about 2,000 right now. But, if past trends in Nunavut are any indication, the shift from mine construction to operation should see growing numbers of local workers join new mine sites. 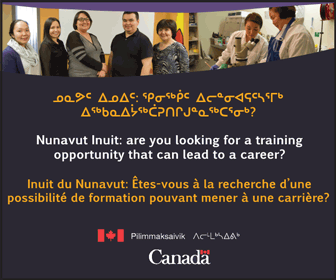 Nunavut residents are also becoming more employable. When the territory was formed, the high school graduation rate stood at around 21 per cent. “That’s one person out of five,” said Picotte. Now, about half of Nunavut high school students graduate. When you look at graduation rates by region, the Kivalliq sees a big improvement around 2007-o8. That’s when Meadowbank mine opened, notes Picotte. He speculates that may be an indication that children are becoming more motivated to stay in school, when they see adults in their lives receiving gainful employment from mines. The territory’s graduation rate saw a big improvement over the past two years. Over that period, Nunavut gained about 100 graduates. “Something’s going on, and it’s good news,” said Picotte. 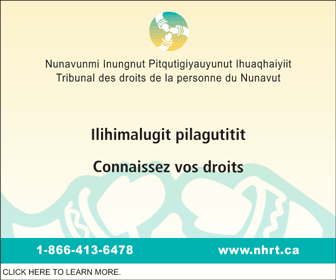 Wow, good news for Nunavut. Let’s see what the keyboard warriors and negative neds have to say. WHAT A jumble of contradiction and number manipulation. Any one of Picotte’s statements falls apart with even thin analysis. The author’s interpretation is as suspect. NEARLY $9 billion has been spent by mining companies to develop operations in Nunavut over the past decade. Curious how much has filtered into Nunavut’s economy and its population of 38,000 – 8,000 of whom work for GN, GOC, Hamlet or an NGO; 19,000 of whom are too young or too old to work; 7,000 of whom are adults who still have never worked and most of whom have never hunted nor gathered; 1,000 who are independent professionals or consultants; 200 of whom work in retail and entry level jobs; …? How much of the mining economy has spilled into the health and education of your children? Of all the Canadian private industries that impact local economics, resource extraction and export is the one that contributes least – and by a large margin. Yep, that definitely affects the import export ratio. Helpful math Picotte. FURTHER, the economist states: “In 2019, mining’s share of Nunavut’s economy is expected to surpass government spending for the first time in the territory’s history.” Implying that the $1.4 billion being spent by mining is comparable to $1.4B spent by government. Truth be told, well over $3B government dollars will be spent in NU in fiscal 2019. This is how we are informed by the chief economist of NU who has been informing us for a decade or more. THE GRADUATION-RATE comments are even woosier. “Now, about half of Nunavut high school students graduate” says Picotte. “The territory’s graduation rate saw a big improvement over the past two years. Over that period, Nunavut gained about 100 graduates. Something’s going on, and it’s good news” says Picotte. LIKELY the reporter missed on the statistic with that 100 graduates over two years. That calculates to two graduates per community per year. That aside, just under 300 students graduated in 2018, with a five-year moving average of 240 graduates at that time. Of the 10,000 students in NU in 2018, just under 800 were registered for Grade 12 (750 in 2017, closer to 950 in 2019). You do the math on the graduation rate. Of those that graduate, more than 60% are unable to attend university or college without upgrading. A very large chunk of NAC’s resources (facilities and staff) are spent on programs specifically directed toward young-adult literacy and GED instruction. THAT’s a brief analysis of Picotte’s comments. The rest can be mined as easily. Maybe ‘tom’ can do that for us. Did I mention Picotte is NU’s lead economist? Hmmmm, lead has two pronunciations. Maybe I misunderstood.